Macau China is a former Portuguese Colony and is now a Special Administrative Region in China just like Hong Kong. It has both the influences of Chinese and Portuguese Culture. 95% of the people residing here are Chinese and the rest are mixed races called Macanese which are Chinese with a mix of Portuguese. Macau is mainly known as the “Las Vegas Of Asia” as Gambling is one of its main attraction here. However, Macau’s Economy is still largely based on its Tourism. 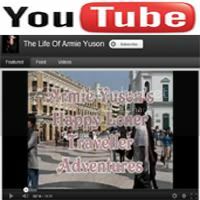 Now, Armie “Happy Loner Traveller” Yuson will explore the cultures, attractions, people and tourist spots of Macau and he will try to know why Macau’s Tourism became a success not only in Asia but in the Global Market as well. 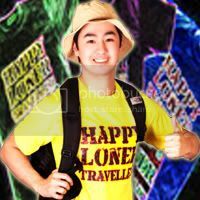 He will get as many ideas as he can so that he could bring these new found informations to his beloved Country, The Philippines, and he could help improve the tourism in the Philippines more, so that we will be the next big thing, not only in Asia but Worldwide!!! He will point out the comparison between the 2 Countries, the advantages and disadvantages of our Country to theirs, so that we could focus on improving these for our Country’s Bright and developing future. So as I arrived in Macau’s International Airport, I noticed that they are very strict in prohibiting of taking photos to the structures of their Airport. Honestly? Our Airport in NAIA Terminal 3 is far better than their Airport. So I checked-in to the most famous hotel in Macau and it is the Venetian Hotel. Venetian Hotel is the 6th Largest Building in the World in terms of floor space and the Largest Casino in the World too. It took 2.4 Billion U.S Dollars to build this Man Made Paradise and it had the concept of Paris France and Venice City Italy to it. The owner Sheldon Andelson, really is one of the greatest pioneers in the World when it comes to Modern Entertainment. Even if you’re not a Gambler, you could still enjoy Macau, there are a lot of things to do inside the Venetian. Venetian itself represents Macau already. Aside from the Hotel and Casino, Venetian also has a Mall, Food Court, Pools, Golf Course, Restaurants, Bars, Clubs, Theaters and much probably everything you wanted to see in a place. 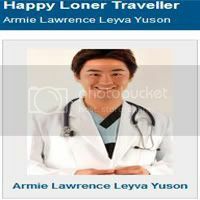 But the best attraction for Happy Loner Traveller is the Romantic Replica of Venice’s Gondola ride. For only 118 Macau Patacca (around an estimate of 708 Philippine Pesos), you could already have a worthwhile experience of the Famous Lover’s ride in Italy. And you could even request the Gondolier to sing an Italian Song for you. How Romantic is that?!! By the way, the currency conversion of Philippine Pesos to Hong Kong Dollars is similar to that of Macau’s Patacca, around 6 Philippine Pesos for 1 Patacca. So on my first day, I just roamed around the Venetian. On my Second day, I made sure that I visited all the prominent sites in the main center of Macau. I went to the Senado Square, it is Macau’s Famous Landmark, together with it is the “Street Of Happiness” or also known popularly as “San Malo” where souvenirs are prominent. I also went to the UNESCO World Heritage Site, the Ruins of Sao Paolo Cathedral and beside it is the Mount Fortress, a historical site similar to that of Fort San Pedro in Cebu or Intramuros in Manila both found in the Philippines. I also went to Macau Museum & the most sacred ground in Macau which is the A-Ma Temple, the name of Macau is thought to be derived from here. The main Religions here are Buddhism, Taoism and Confucianism. And for the rest of my itinerary, I just explored the rest of Macau, I walked and rode the bus most of the time and it just took me 3.20 Patacca (19.20 Philippine Pesos) per ride at night, I just wandered the streets and downtown of the busy district of Macau, just looking and appreciating the bright lights of the City. And I also went through the outskirts and Non Tourist spots of Macau and I really have learned a lot with regards to people’s attitude, lifestyle, education & values here. I even discovered wonderful places here not included in the maplist of the “must visit” Tourist areas of Macau. On my Third day, the only itinerary left to do is to have a “Hotel Hopping”. Going from one hotel to the other is one of the Must do’s of Tourists here. So I went to Galaxy Hotel & Casino, City Of Dreams Hotel & Casino, MGM Grand Hotel & Casino and Grand Lisboa. Each Hotel has its own unique attraction to offer. One of the techniques that I used in Macau so that I won’t be spending too much money is there is a “Cotai Connection”, main Hotels in Macau have partnerships with regards to FREE BUS Rides all over Macau. So I always use this to my advantage and I always eat at the Food Court because it is cheaper than the restaurants outside and you can still taste their unique delectable cuisines. One thing that you should not miss doing here in Macau is tasting their Famous Portuguese Egg Tarts and Dried Meat, you can see a lot of it almost everywhere. And now, after I’ve gotten to know Macau in my 4 Days & 3 Nights Vacation, I can proudly say without being unbiased that I will still choose Philippine Tourism a Million Times!!! Why? We have so much advantages and potential to offer our foreign investors and tourists. We are very excellent in English, even our diction, I was hard up in looking for places because majority of the Chinese doesn’t know how to speak English. I still have to look for fellow Filipinos to ask them how to find a certain place. Filipinos compared to Chinese are very accommodating and hospitable, no race could ever compare to our kindness over our foreign visitors. And it is very pricy in Macau, all of the things there are expensive, almost triple to that of Philippine Pesos. Yes, I admit that these Man Made Structures really amazed me but it’s still incomparable to the Natural and unspoiled beauty of the Philippines. God’s Creation is still the best in letting you experience true peace of mind when it comes to his gift of Nature to us. I still choose Nature compared to Man Made Structures! However, we could help put a little improvement to it with the use of friendly innovations too like placing a replica of the Gondola ride to Baguio’s Burnham Lake. And also, the things we need to focus on improving is our cleanliness to our surroundings, I just compared their downtown to us, their busy districts are still very clean while our downtown area is full of Garbage. And their Crime rate is very low while in our Country, you could hear a lot of crimes done by Filipinos to their Fellow ones. We must eradicate those things so that people from other Countries won’t judge us. It will help a lot in improving Philippines Tourism. Major Countries in the World got rich and successful because they mainly focused on their Tourism. Malaysia has 450 Million Foreign Visitors last year alone because of their value to Tourists. Macau is listed as Top 21 in the World as the most visited Country by Tourists. Us in the Philippines? Only 2% of the Foreign Visitors explored our Country. So as you can see, We are very far behind from marketing Philippine’s Beauty to the whole Globe, whereas I strongly believed that we have the best Natural Beauties not only in Asia but in the World!!! haha! your comment made me laugh doc! hindi naman po... hehe! thanks for appreciating my photos doc! God bless! :-) more power to us!